Facial steaming is a relatively new method for deep cleansing without using any chemicals on your face. Ardent facial steamers say that this technique helps them get rid of acne, blackheads and dirt and grime that get lodged in pores on a daily basis. Facial steaming is considered to be safe on all skin types, including on sensitive skin. Regular steaming may help your skin maintain its natural luster and keep blemishes and other problems at bay. Facial steaming is also an affordable skincare technique. Secura Nano Ionic is one of the best recognized brands in the facial steaming world. This small facial steamer is quite popular thanks to its effectiveness and portability. It’s not too heavy to hold up for long periods. Also, this facial steamer is considered to be quite safe, even for people with skin conditions like severe acne. This facial steamer is has an appealing exterior too. But looks are not everything. This device works by generating a superfine, “nano scale” hot steam onto the face. The skin can easily absorb this steam and become well moisturized in no time. Secura Nano Ionic generates the steam in a matter of seconds, so you won’t have to wait for long for the device to work. The heat of the steam can open up the pores on your face and remove dirt causing clogging. This device is also effective in removing excess oil from your face without using any type of harsh chemical. If you are sick of using abrasive and irritating deep pore cleansers, this facial steamer will be a gentler change. 1-year warranty. Product only for use with North American Electrical Standards, 120V 60Hz. This facial steamer generates a smooth and soothing mist that is cleansing as well as relaxing. This steamer is designed to work on your skin without causing redness or irritating sinus glands. The hot steam will cleanse and hydrate your skin as gently as possible. For best effect, the manufacturer recommends using distilled or purified water with this device. This steamer creates an anion spray out of the water that can penetrate the pores and remove the impurities stuck inside. You can use this steamer to remove bacteria that cause acne, excess oil or matted dirt that results in blackheads. This facial steamer can detoxify skin, clean out tiny hair follicles, and completely remove dead skin cells. It’s recommended to use this steamer on your face for cleansing before using further treatments like facial masks. This device works fast too. You only need to work it for about 40 seconds on your face to get the intended results. Unlike the ion ones above, this facial steamer is powered by ozone. It creates an oxygenated spray that you can use to sterilize skin and gently clean. This facial steamer is quite ergonomically designed. It has an arm that can be twisted in any direction that is most convenient to the user. Left-handed users will find this steamer much easier to use than others. The steamer has controls that are easy to use. Two buttons are available to turning on pr off the ozone steam. You can turn off the ozone function and use a regular steam as well. The steamer conveniently turns off automatically if the water level is too low. This is a highly effective steamer for moisturizing as well as promoting better blood circulation on your face or other parts of the body. This facial steamer is intended for both professional and home use. The steamer can power up in seconds and start generating the steam without a delay. So, you can easily use it no matter how busy you are. New models now use regular water. Do not need to use distilled water for this steamer. Heat resistant plastic jar. These do not melt with our facial steamers. Separate ozone switch. Twistable arm. This is an ultra-small facial steamer well suited for travelling. It’s made from ceramic coils and uses PTC technology to generate a soothing and cleansing steam in under 30 seconds. This facial steamer has one of the shortest start to steam times in the current market. This facial steamer also has an internal fan to keep the device from overheating and your skin relaxed. It’s recommended to use this facial steamer regularly to get the best results. 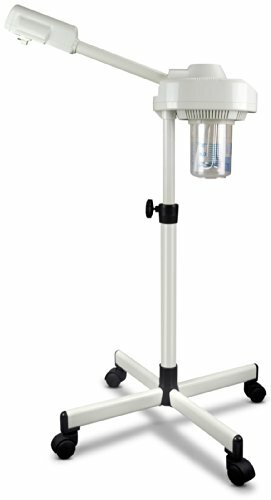 Listed benefits of this facial steamer are many. It is said to smoothen rough skin, moisturize, reduce the appearance of acne, remove dirt, oil and makeup, remove dead skin cells and even lighten up dark spots. It doubles as an aromatherapy device when you want to relax. You can use this facial steamer in the place of chemical cleansers, exfoliators or scrubs without any issues. In dry weather, this steamer can also be used as a personal humidifier. 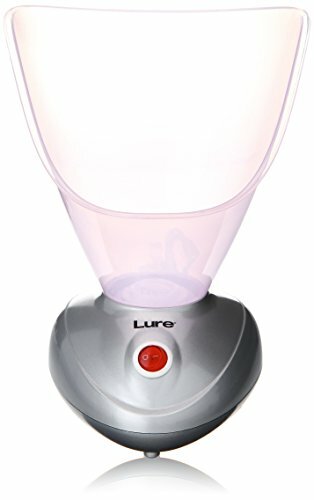 Lure Steam is an American-made professional facial steamer. It’s intended to clean and also hydrate dry or dull skin on the face. This facial steamer is designed to be significantly lightweight and easy to hold. This facial steamer is highly recommended for travel as well. It’s relatively easy to use. You just need to bring the face cup close to your skin and then turn the device on. The cup is designed ergonomically to fit the contours of your face. In a matter of seconds, a gentle and cleansing steam will hit your face. 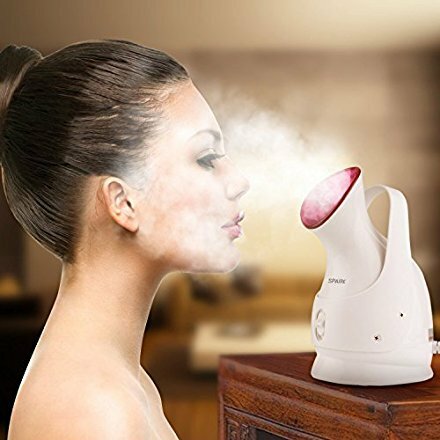 You can quickly turn off the steamer to stop the mist.Use this facial steamer regularly to make your face look younger, healthier and brighter in general. It’s highly suited for deep pore cleansing and extreme hydration of face. You can generally get more rejuvenated skin using this facial steamer. Conclusion: Facial steamers are an excellent alternative to chemical cleansers and scrubs that can do more damage to the sensitive skin on your face than good. Facial steamers can be used regularly for both cleansing and moisturizing. Use one from the list given above. High-end steamers like the ones mentioned above are gentle to use, last long and offers excellent bank for your buck.